A walker has been rescued after getting lost while walking across Ben Macdui on Saturday. Missing: The man was walking on Ben Macdui. A search was launched for the man on Ben Macdui at about 8pm on Saturday. 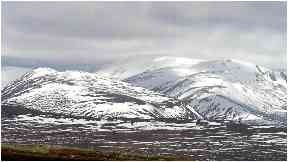 Members from Braemar and Aberdeen mountain rescue teams were involved in the operation. Poor weather conditions meant that a Coastguard helicopter was unable to join the search. A police spokesman confirmed that the walker was found at around midnight and was not suffering any injuries.